That’s the drawback with eating out – no leftovers for lunch the next day. I was getting somewhat bored with my default “no-leftovers-for-lunch” lunch – a mackerel, spinach and broccoli salad, so much so in fact that I was starting to tire of opening the tin and flaking the fish. 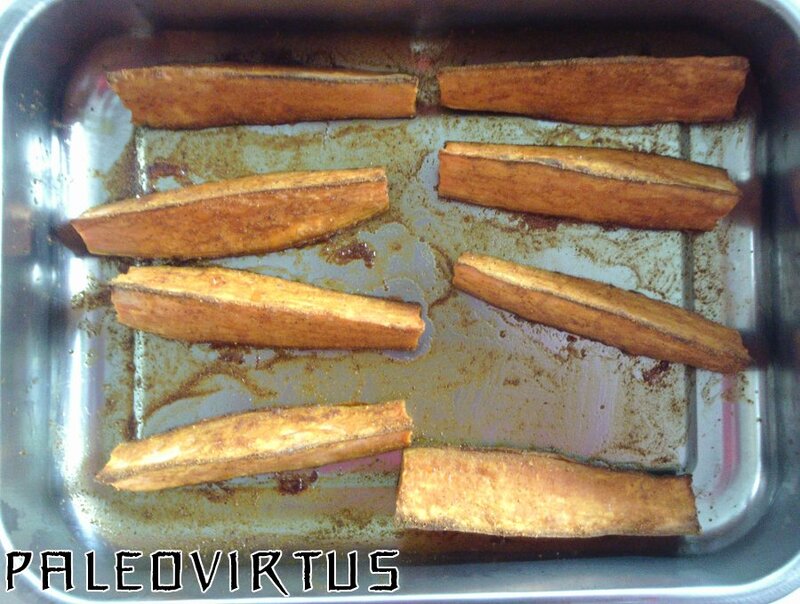 This entry was posted in Food Diary, Recipes and tagged bacon, leek, lunch, paleo, recipe, soup, sweet potato on December 17, 2014 by paleovirtus. Once upon a time, clan Paleovirtus lived in Brussels. Then, in the early part of 1999, the Dioxin Crisis struck. Suddenly, all locally sourced meat and poultry was deemed to be tainted. This entry was posted in Food Diary, Recipes and tagged African, mushrooms, paleo, recipe, spinach, stew, sweet potato on December 12, 2014 by paleovirtus. I’d wanted to try out the concept of the Portobello mushroom burger “bun” for some time now. It’s one of those brilliant Paleo vegetable-based replacements, such as zucchini pasta or cauliflower rice, but one that I hadn’t got around to playing with yet. I think I was waiting for a burger fit to team them up with, a new recipe. And so it came to pass that over a pot of Oolong tea and a slightly over-ripe conference pear that inspiration struck. The flesh of a good pig was needed. Yes, minced pork. And what goes well with pork? Sage and onion, mais naturellement! Garlic by the fistful? A lovely smoky, hot, Spanish paprika? Bring it on! Ladies and gentlemen, we have a winner….. In a large mixing bowl mix together the minced pork, sage, onion, garlic, Dijon mustard, egg, 1 tsp smoked Spanish paprika, and black pepper to taste. Take a ball of the meat mixture larger than a golf ball but not quite as large as a tennis ball. Flatten it into a burger shaped disk, about as thick as your finger. Repeat for the rest of the mixture. You should get about 8 burgers from 800g pork. Heat 2 tbsp of olive oil in a non-stick frying pan. Fry the burgers in batches, giving them 6 minutes per side, 12 minutes in total. Repeat for the rest of the burgers. Prepare the Portobello mushroom buns. Wipe or brush them clean, then trim back the stalks. Brush a little olive oil on to the top of the cap, and then place them gill-side up on baking parchment on a baking tray. Drizzle over a small amount of olive oil, and then season with smoked Spanish paprika, salt, and pepper to taste. Bake in the oven for about 15 minutes or so, but keep a close eye on them after the 10 minute mark. Remove the mushrooms from the oven, and then carefully lift them up with a plastic spatula and a wooden spoon, in order to drain off the excess water that will have come out of them during baking. Plate up. Simply use a pair of mushrooms as you would use burger bread-buns, with one beneath the pork burger, and one above it. Serve, together with sweet potato fries. During our post-dinner discussion, it was suggested that a small amount of grated apple might work well in the burgers. I kept the presentation side of things as simple as possible here, as you no doubt have noticed. This was intentional – it was the first outing for this particular burger recipe, and it was also a début for the Portobello mushroom burger-bun, too. A stripped back, minimalistic presentation, I believe, allows you to figure out if the taste and texture of a new dish works as is, without what may be complicating factors from garnishes, sauces, etc. Chalk one up for a background in experimental procedure. Both Mrs. Paleovirtus and Paleovirtus Jr. were impressed with both burger and buns alike, which in the case of Paleovirtus Jr. is quite extraordinary, seeing as she is usually to be found heading in the opposite direction at a rapid rate of knots whenever mushrooms appear on a menu. One improvement that would be nice both as far as the taste and appearance of the top “bun” goes would be the addition of sesame seeds. Getting them to stick to the surface of the bun without adding any substance that would otherwise spoil the bun’s taste or texture, such as lemon juice or even more oil, might prove to be tricky, however. As far as sauces and other garnishes go, the consensus seemed to be that in this case less really would be more, and that the taste of the burgers would best be served by a tomato based, smoky, “BBQ” type of sauce. Bacon was also named as a possible garnish, too, a cut with a smoky, possibly sweet-ish character. Watch this space, as they say. 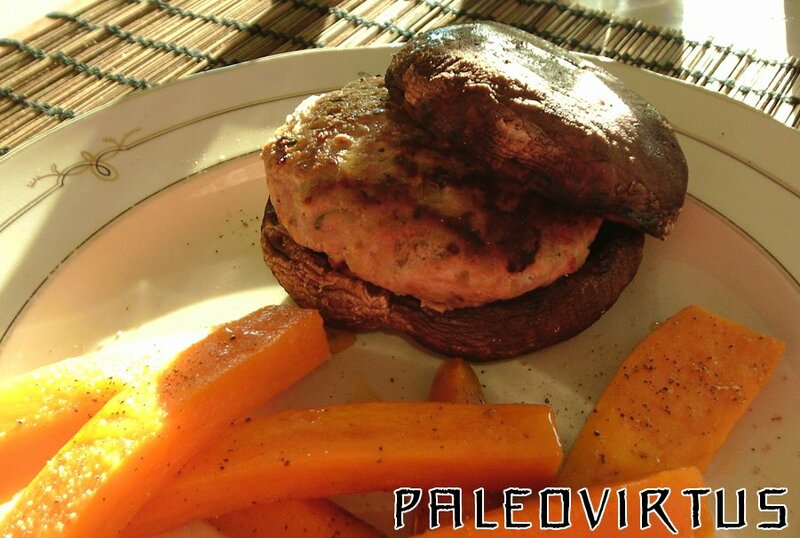 This entry was posted in Food Diary, Recipes and tagged burger, mince, paleo, pork, Portobello mushrooms, recipe, sage and onion, sweet potato on October 13, 2014 by paleovirtus.